It's time for another color challenge at The Play Date Cafe. 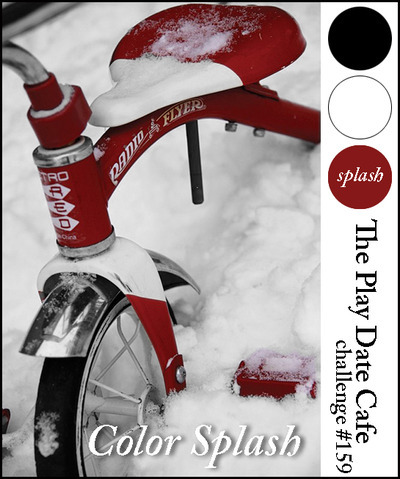 This week it's everybody's favorite - a color splash. And our splash of color this week is Maroon. So you project should include black, white and a splash of maroon. Perfect for your holiday projects. I hope you can join us this week. I can't wait to see what you create!! 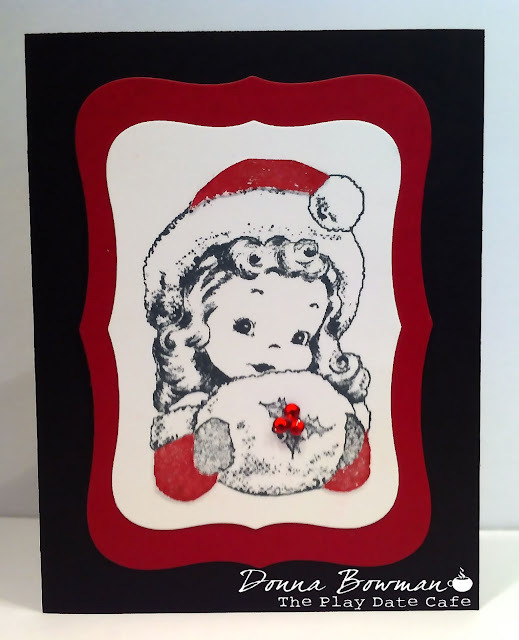 My card uses a sweet Christmas girl from a stamp set by Artistic Outpost called Frosty Friends. The papers are Whisper White, Cherry Cobbler and Basic Black from Stampin' Up. The ink is Tuxedo Black by Memento and Cherry Cobbler by Stampin' Up. The dies are Nestabilities. I stamped her once in Cherry Cobbler and cut out her sleeves and hat. The rhinestones are Queen & Co.
Our lucky winner this week will get an awesome prize from the PDCC Prize Vault and trust me - it is filled with some major crafty goodness. I hope you will be able to join us and I can't wait to see what you create!! Since this card fits the theme of this week Cupcake Craft Challenge I'm going to enter it there. Isn't she so sweet! LOVE the added bling! Oh Donna! I adore this card!! Her sweet smile is sure to put a smile on everyone's face!! oh so lovely, gorgeous vintage look and the added gems are perfect! Love the vintage look of this, and the gems on her muffler look great! Donna this is simply adorable, such a sweet image!! oh my GORGEOUS... wow what a sweet image..
What a sweet image, perfect for a vintage-y black and white theme. The berries on her muff are so fun!